An Assistant Housekeeping Manager not only assists the Housekeeping Manager but they also disburse various roles and responsibilities that may include inspecting rooms for cleanliness, ensuring the standard rules and safety is adhered upon, checking every details of the room from Fridge to beds, coordinating with housekeeping managers in work delegation, maintaining schedule of housekeepers, organizing parties as per the client needs, placing food orders, displaying and arranging food in an attractive manner and maintaining highest level of guest satisfaction. 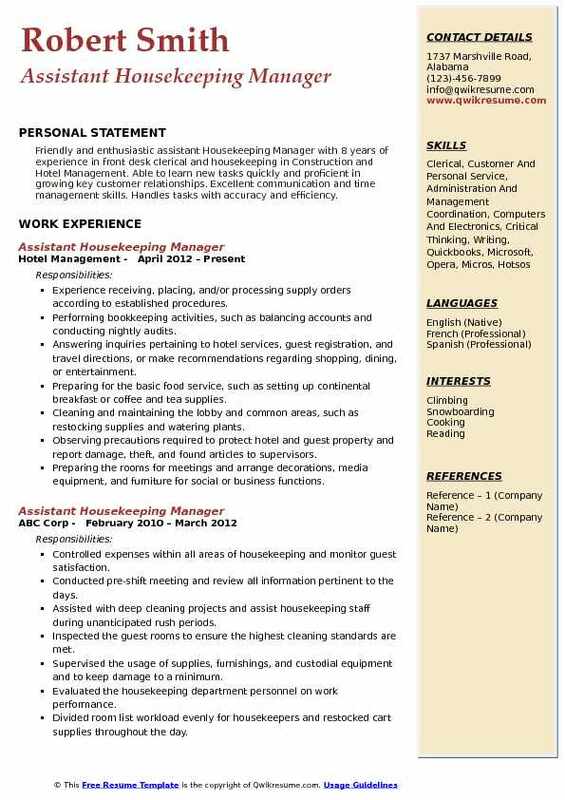 A refined Assistant Housekeeping Manager Resume should emphasize job skills such as supervisory skills, communication and organizational skills, housekeeping expertise, attention to details and good customer orientation. 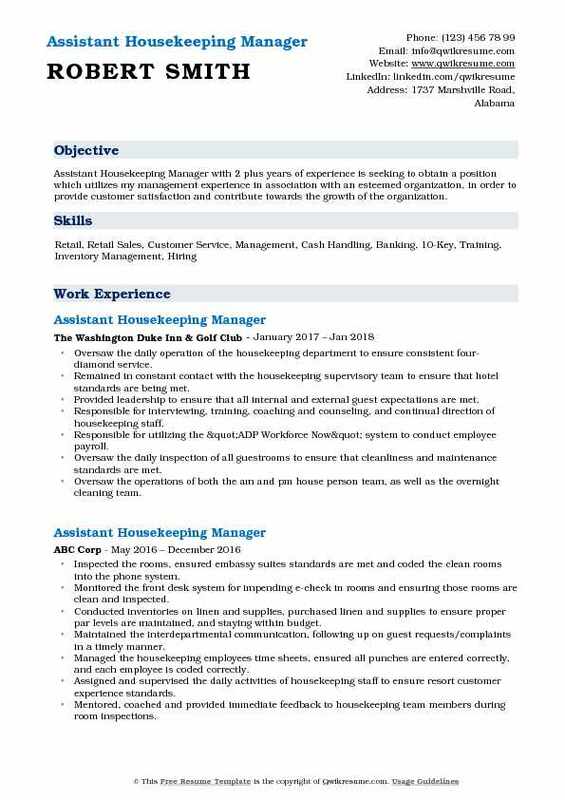 Eligible candidates for the job role of an assistant housekeeping manager normally highlight training in hospitality, but employers also prefer a high school diploma with some prior supervisory experience while dealing with this hiring. 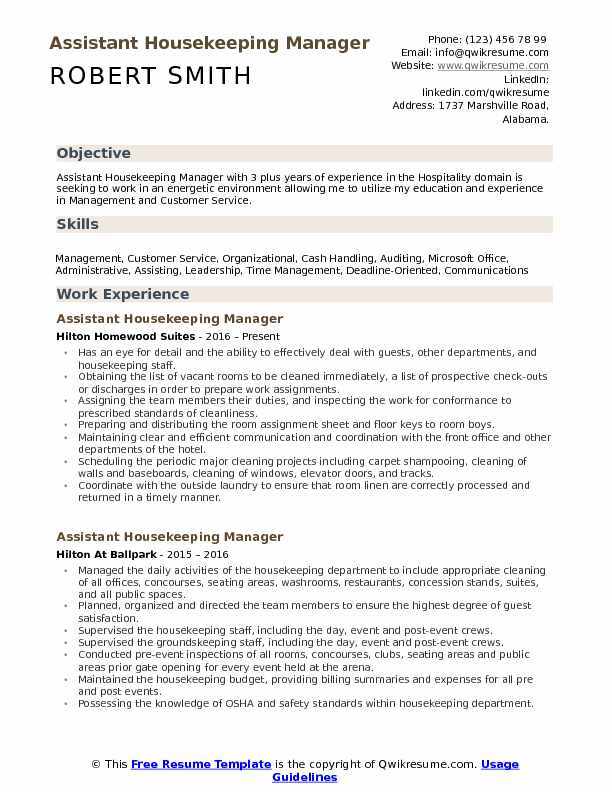 Objective : Assistant Housekeeping Manager with 3 plus years of experience in the Hospitality domain is seeking to work in an energetic environment allowing me to utilize my education and experience in Management and Customer Service. Has an eye for detail and the ability to effectively deal with guests, other departments, and housekeeping staff. Obtaining the list of vacant rooms to be cleaned immediately, a list of prospective check-outs or discharges in order to prepare work assignments. Assigning the team members their duties, and inspecting the work for conformance to prescribed standards of cleanliness. Preparing and distributing the room assignment sheet and floor keys to room boys. Maintaining clear and efficient communication and coordination with the front office and other departments of the hotel. Scheduling the periodic major cleaning projects including carpet shampooing, cleaning of walls and baseboards, cleaning of windows, elevator doors, and tracks. Coordinate with the outside laundry to ensure that room linen are correctly processed and returned in a timely manner. Delegate assignments and supervise all staff, room attendants, lobby attendants and turndown attendants. 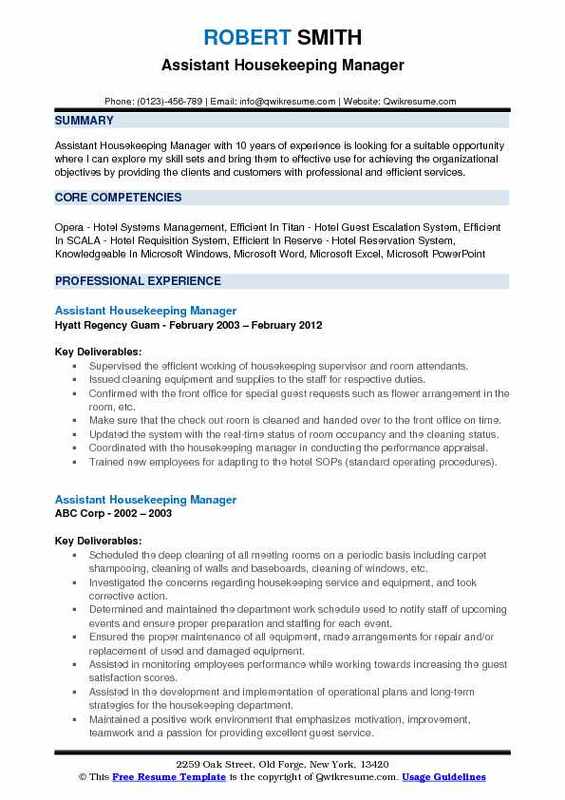 Summary : Assistant Housekeeping Manager with 10 years of experience is looking for a suitable opportunity where I can explore my skill sets and bring them to effective use for achieving the organizational objectives by providing the clients and customers with professional and efficient services. Supervised the efficient working of housekeeping supervisor and room attendants. Issued cleaning equipment and supplies to the staff for respective duties. Confirmed with the front office for special guest requests such as flower arrangement in the room, etc. Make sure that the check out room is cleaned and handed over to the front office on time. Updated the system with the real-time status of room occupancy and the cleaning status. Coordinated with the housekeeping manager in conducting the performance appraisal. Trained new employees for adapting to the hotel SOPs (standard operating procedures). Responsible for the overall function of the front office; assigns tasks as needed. Assisted the Office Manager with front office administrative duties and coordinated the office function and workload. Summary : Highly energetic and motivated Assistant Housekeeping Manager with 7 plus years of extensive management experience. Demonstrated leader with the ability to consistently exceed goals.provision of housekeeping services in according to the hotel standards policies and procedures.excellent attention to details and delegate skills and a great team motivator that leads by example. Controlling all expenditures relating to housekeeping, including labor, guest room supplies, and all cleaning supplies and equipment. Recording data concerning work assignments, personnel actions, and time cards, and prepares periodic reports. Attending the staff meetings with other departments heads to discuss company policies and patrons complaint, and to make recommendations to improve service and ensure more efficient operation. Confirming all housekeeping staff members arrive or find substitutes for absent employees. Training the housekeeping operations, coaching, and also enforcing to the hotel's standard operating procedures. Ensuring that the guest rooms are properly secured and that proper key control procedures are utilized by the housekeeping staff. Demonstrating the ability to effectively deal with guests, other departments, and housekeeping staff. 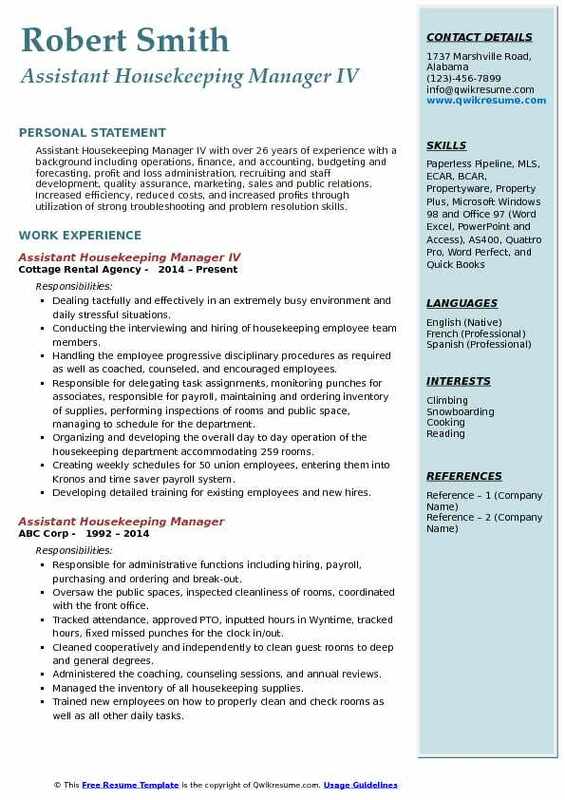 Objective : Assistant Housekeeping Manager with one plus years of experience in the Hospitality domain is seeking a challenging career in which my dedication to quality service can continue to grow through my strengths in communication and recreation. Possessed the complete knowledge and understanding of OSHA regulations ensured they were up to date. Ensured effective and efficient communication with all other departments and levels of management. Worked effectively with the engineering department on guest room maintenance needs. Understood loss prevention policies and procedures while effectively and efficiently working with all loss prevention team members. Assisted in supervising an effective inspection program for all guestrooms and public space. Managed the generally clean and preventative maintenance team to ensure all rooms were serviced on a quarterly, bi-annual and annual schedule. Managed all orders, invoices and financial responsibility of the housekeeping department. Developed, conducted, and reported monthly financial reviews with the accounting and senior leadership team members. Supervised staffing levels to ensure that guest service, operational needs, and financial objectives are met. 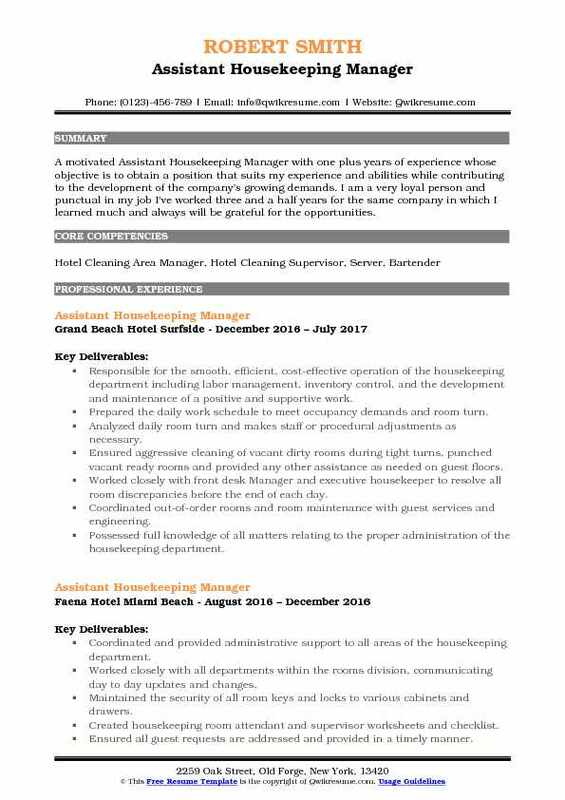 Summary : Assistant Housekeeping Manager IV with over 26 years of experience with a background including operations, finance, and accounting, budgeting and forecasting, profit and loss administration, recruiting and staff development, quality assurance, marketing, sales and public relations. Increased efficiency, reduced costs, and increased profits through utilization of strong troubleshooting and problem resolution skills. Dealing tactfully and effectively in an extremely busy environment and daily stressful situations. Conducting the interviewing and hiring of housekeeping employee team members. Handling the employee progressive disciplinary procedures as required as well as coached, counseled, and encouraged employees. Responsible for delegating task assignments, monitoring punches for associates, responsible for payroll, maintaining and ordering inventory of supplies, performing inspections of rooms and public space, managing to schedule for the department. Organizing and developing the overall day to day operation of the housekeeping department accommodating 259 rooms. Creating weekly schedules for 50 union employees, entering them into Kronos and time saver payroll system. Developing detailed training for existing employees and new hires. 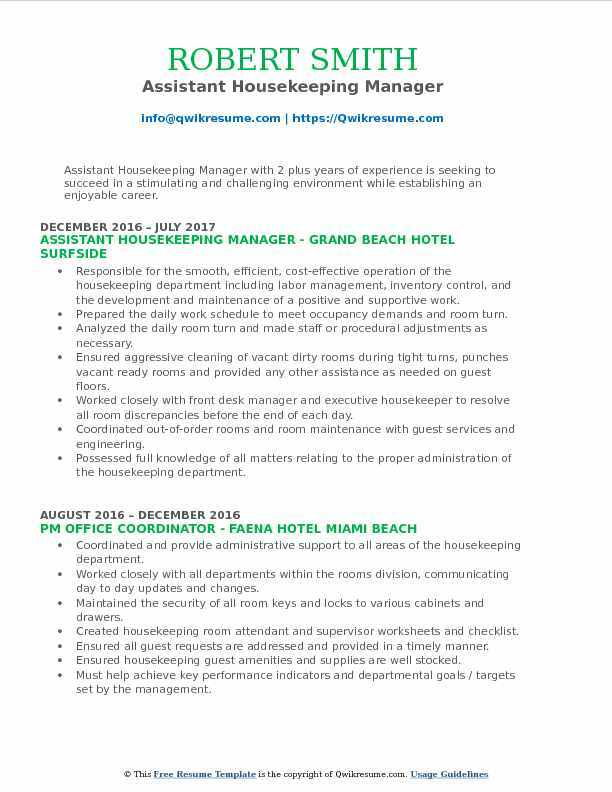 Objective : Assistant Housekeeping Manager with 2 plus years of experience is seeking to obtain a position which utilizes my management experience in association with an esteemed organization, in order to provide customer satisfaction and contribute towards the growth of the organization. Oversaw the daily operation of the housekeeping department to ensure consistent four-diamond service. Remained in constant contact with the housekeeping supervisory team to ensure that hotel standards are being met. Provided leadership to ensure that all internal and external guest expectations are met. 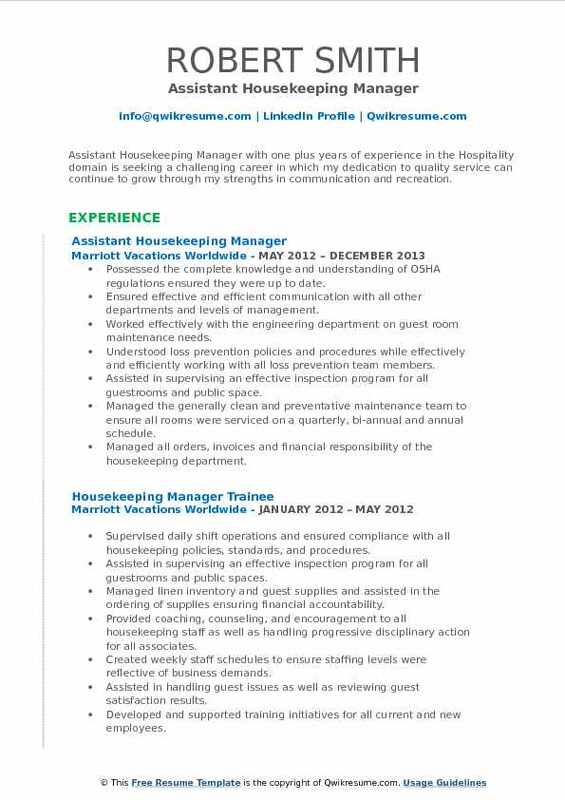 Responsible for interviewing, training, coaching and counseling, and continual direction of housekeeping staff. Responsible for utilizing the "ADP Workforce Now" system to conduct employee payroll. Oversaw the daily inspection of all guestrooms to ensure that cleanliness and maintenance standards are met. Oversaw the operations of both the am and pm house person team, as well as the overnight cleaning team. Handled all guest requests in a timely manner to ensure guest satisfaction. Uphold daily service meetings with the housekeeping team each morning. 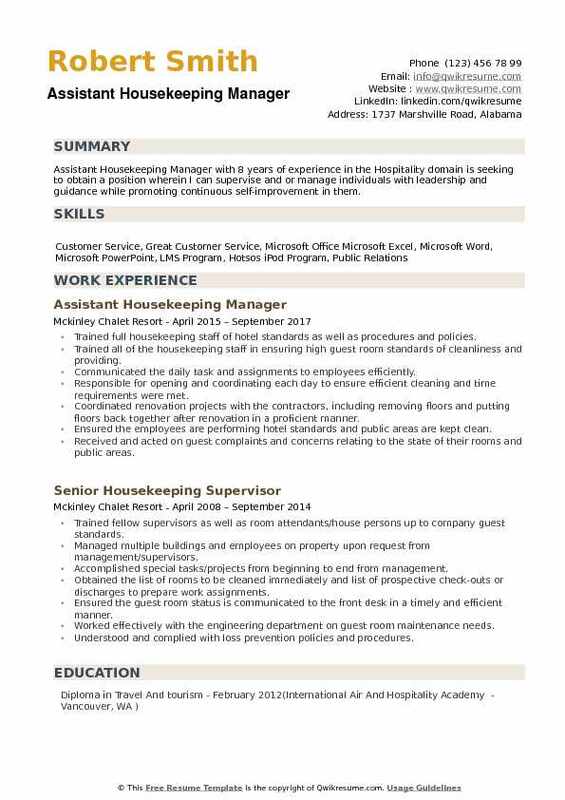 Prepared all housekeeping employee; absence/tardy, time off, employee review, and disciplinary paperwork as needed. 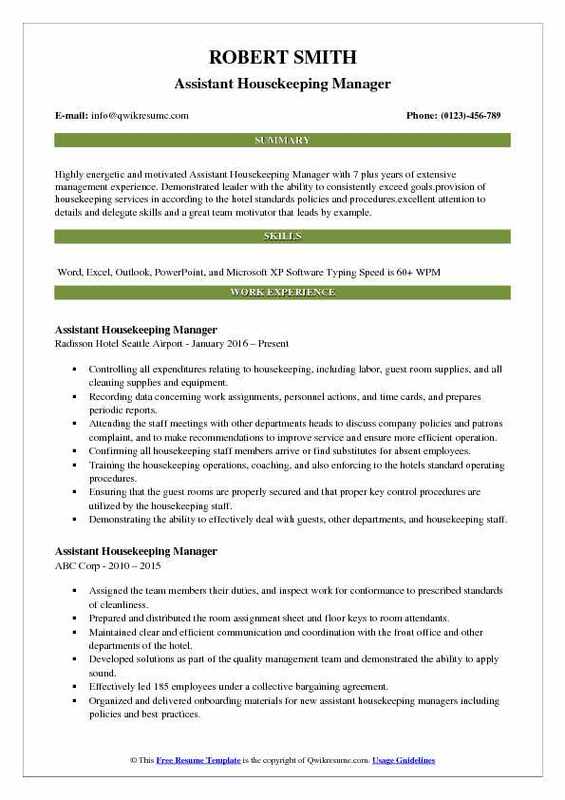 Objective : Assistant Housekeeping Manager with 2 plus years of experience is seeking to succeed in a stimulating and challenging environment while establishing an enjoyable career. Responsible for the smooth, efficient, cost-effective operation of the housekeeping department including labor management, inventory control, and the development and maintenance of a positive and supportive work. Prepared the daily work schedule to meet occupancy demands and room turn. Analyzed the daily room turn and made staff or procedural adjustments as necessary. Ensured aggressive cleaning of vacant dirty rooms during tight turns, punches vacant ready rooms and provided any other assistance as needed on guest floors. Worked closely with front desk manager and executive housekeeper to resolve all room discrepancies before the end of each day. Coordinated out-of-order rooms and room maintenance with guest services and engineering. Possessed full knowledge of all matters relating to the proper administration of the housekeeping department. Maintained close contact and ensures good communication with employees. Ensured that responsive and efficient repair services are provided to satisfy guest requests. Objective : A motivated Assistant Housekeeping Manager with one plus years of experience whose objective is to obtain a position that suits my experience and abilities while contributing to the development of the company's growing demands. I am a very loyal person and punctual in my job I've worked three and a half years for the same company in which I learned much and always will be grateful for the opportunities. Analyzed daily room turn and makes staff or procedural adjustments as necessary. Ensured aggressive cleaning of vacant dirty rooms during tight turns, punched vacant ready rooms and provided any other assistance as needed on guest floors. Summary : Friendly and enthusiastic assistant Housekeeping Manager with 8 years of experience in front desk clerical and housekeeping in Construction and Hotel Management. Able to learn new tasks quickly and proficient in growing key customer relationships. Excellent communication and time management skills. Handles tasks with accuracy and efficiency. Experience receiving, placing, and/or processing supply orders according to established procedures. Performing bookkeeping activities, such as balancing accounts and conducting nightly audits. Answering inquiries pertaining to hotel services, guest registration, and travel directions, or make recommendations regarding shopping, dining, or entertainment. Preparing for the basic food service, such as setting up continental breakfast or coffee and tea supplies. Cleaning and maintaining the lobby and common areas, such as restocking supplies and watering plants. Observing precautions required to protect hotel and guest property and report damage, theft, and found articles to supervisors. Preparing the rooms for meetings and arrange decorations, media equipment, and furniture for social or business functions. Summary : Assistant Housekeeping Manager with 8 years of experience in the Hospitality domain is seeking to obtain a position wherein I can supervise and or manage individuals with leadership and guidance while promoting continuous self-improvement in them. Trained full housekeeping staff of hotel standards as well as procedures and policies. Trained all of the housekeeping staff in ensuring high guest room standards of cleanliness and providing. Communicated the daily task and assignments to employees efficiently. Responsible for opening and coordinating each day to ensure efficient cleaning and time requirements were met. Coordinated renovation projects with the contractors, including removing floors and putting floors back together after renovation in a proficient manner. Ensured the employees are performing hotel standards and public areas are kept clean. Received and acted on guest complaints and concerns relating to the state of their rooms and public areas. Ensured the employees have the right equipment, used proper chemicals and follow safety guidelines. Operated all aspects of the PMS Opera, some micros, and inventory system.